FORT LAUDERDALE — Marine artist Guy Harvey exhibited at his first Fort Lauderdale International Boat Show 30 years ago and has exhibited at every one since. Marine artist Guy Harvey (left) was honored Wednesday for his business success and contributions to marine education, research and philanthropy. 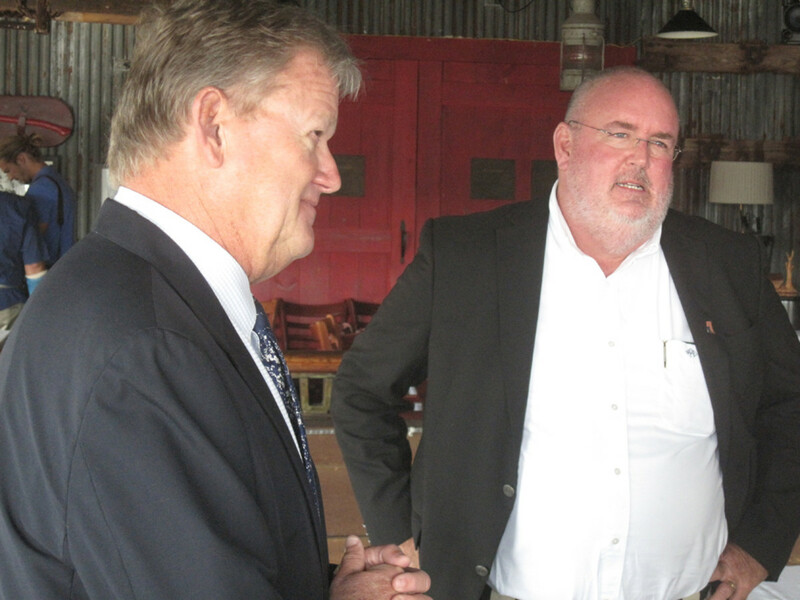 He is shown with Marine Industries Association of South Florida executive director Phil Purcell. FORT LAUDERDALE — Marine artist Guy Harvey exhibited at his first Fort Lauderdale International Boat Show 30 years ago and has exhibited at every one since while becoming not only a successful sportfish artist and entrepreneur, but also a philanthropist, conservationist and educator. 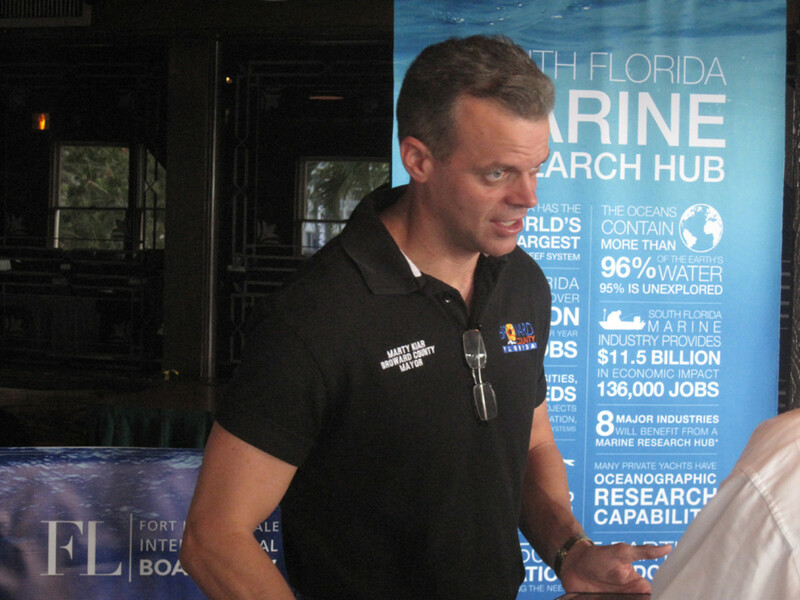 Broward County Mayor Marty Kiar recognized Harvey on Wednesday for his business success and his contributions to marine education, research and philanthropy at a press conference at Fort Lauderdale’s 15th Street Fisheries. Harvey received a key to the county as local dignitaries — U.S. Rep. Ted Deutch, Dania Mayor Walter Duke, Marine Industries Association of South Florida executive director Phil Purcell, Efrem “Skip” Zimbalist III, president of Show Management, which produces the Fort Lauderdale show, MIASF president Danielle Butler and Bob Swindell, CEO of the Broward Alliance, a business group — looked on. Harvey started by selling his art and T-shirts at the show from a cut-out shipping container that he shared with another exhibitor and used it as a launch pad for his art and business. Seventeen years ago, as his success and profits soared, he founded the Guy Harvey Ocean Foundation and donated money to set up the Guy Harvey Ocean Institute at Nova Southeastern University to study and save the world’s fish resources. “There’s no better place to set up your business than this environment in South Florida,” said Harvey, whose world headquarters is in nearby Davie. Broward County Mayor Marty Kiar speaks during Wednesday’s press conference. Purcell said South Florida has one of the nation’s largest concentrations of ocean research institutions and that the show can bring entrepreneurs, researchers, philanthropists and superyacht owners/executives together in an environment of cross-fertilization that can benefit the yacht business, as well as marine research and philanthropy. “We see a lot of CEOs — that caliber of people — visiting here,” said the Broward Alliance’s Swindell. Forty percent of attendees are high-level executives, the MIASF said. “This is a great opportunity to show off Fort Lauderdale’s assets to them,” Swindell said. Purcell said the presidents of Nova Southeastern, Florida International and Florida Atlantic universities and the director of oceanography at the University of Miami will attend the Fort Lauderdale show, which opens today and continues through Monday, to explore opportunities and meet some of these visitors. The show has more than 1,500 boats on display and 1,200 exhibitors, seven show sites and 3 million square feet of exhibition space. “This will be by far the biggest show yet,” Zimbalist said.